Co-Optimus - Video - Call of Duty: Black Ops 2 Uprising DLC Introduces "Mob of the Dead"
Call of Duty: Black Ops 2 will receive another installment of DLC in less than two weeks. The latest digital offering from the ballistic behemoth will feature four new multiplayer maps and one hot new Zombie mode. The "Uprising" map pack will take the industry's most popular multiplayer versus gameplay to several locations around the world. Co-op players will be treated to a Zombie version of Alcatraz in the new undead game mode, "Mob of the Dead." The four new maps are dubbed "Encore," "Vertigo," "Magma," and "Studio." "Encore" takes place at an abandoned music festival. I think it would have been better if it happened during the concert, but whatever. "Vertigo" is yet another rooftop map. Oh good! I wonder what will kill me first, the 12 year old, or the fall? "Magma" looks interesting, mostly because there will be a lava hazard. How has CoD not done lava level yet? "Studio" takes place on a Hollywood back lot filled with different props and scenery. It's sort of a spiritual successor to the first Black Ops' "Firing Range," which is coincidentally the last map where I has a positive K/D ratio -back in 2011. Check out the video to see it all in action. You didn't think I forgot about the co-op, did you? "Mob of the Dead" will be take a page from the "Call of the Dead" campaign. Ray Liotta, Chazz Palminteri, Joe Pantoliano, and Michael Madsen will fight against murderous, undead prison guards and convicts. The iconic prison island of Alcatraz will be their battle ground. To make things even better/more bizarre, fallen players can be taken to "Purgatory." According to the press release, "This new twist on Zombies gameplay is ripe with its own set of objectives, and offers fans a truly new and unique experience." What the hell does that mean? Who cares? It's Call of Duty: Black Ops 2 DLC! MILLIONS of people are going to buy it! NOT-SO-NINJA EDIT: *Or they already have purchased the DLC, seeing as how it's part of the $50 season pass. 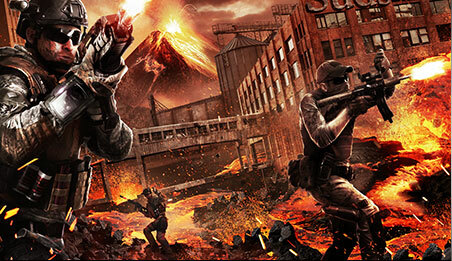 The "Uprising" DLC will be available on the Xbox 360 on April 16th. It's priced at 1200 MSP, or $15. It will come to PS3 and PC at a later date. I'm guessing about a month later. Call of Duty: Black Ops 2 supports four player local co-op and four player online co-op. Page created in 0.3236 seconds.